Penang, Gurney Drive is no alien place to me, but I only got to know G Hotel a few months ago. As I made a check on the internet, there were so many controversies reviews on G Hotel, Penang. Nevertheless, I introduce this hotel to Ms Kuddle (Papa Snew's sister) and she is all thumbs-up for the hotel. With its good location, we decided to stay there when we confirmed our Penang Trip with our folks. 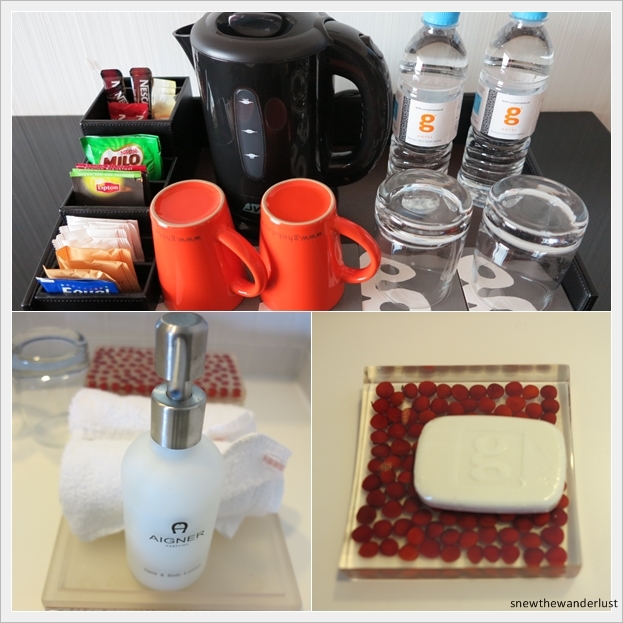 G Hotel has one of the best location in Penang. Located at the famous boulevard in Penang - Gurney Drive, the hotel is just a few steps away from the renowned Gurney Drive Hawker food, and just next door to one of the most happening - Gurney Plaza, a 7th-storey shopping mall. Not too far from the main city center, but yet have the views of the sea. We were greeted with Raspberry Ice-cream while settling the paper work at the Check-In counter. A nice touch, and different from the usual Welcome Drink. The lobby is modern and stylist. No surprise on its claim to be Malaysia's most stylish address. The lobby alone is enough to impress. Tall Ceiling, modernly styled. The G Lounge, or lobby lounge is just adjacent to the reception area. The G Cafe is just next to the G lounge, making the entire area spaciously longest. We did not try the G Cafe, but the alfresco dining area is a place that I would like to be chilling out. We were upgraded to a Deluxe Seaview room. What a good deal! I managed to squeeze out a promotion rate from Agoda, paying a good deal of $177 per room night, including taxes, and now, we are upgraded to a seaview room! Could it be due to the fact that the hotel is running full occupancy, so they need to upgrade some of the guests? Well, whatever it is, we got a nice room. I really love the bay window and sofa. Can really sit there and just admire the esplanade and bay view. Nothing too impressive about the sea though, as part of it has dried up with lots of debris. This is the view from the window. You can actually see Straits Quay from here. One of the nice value-adds in G Hotel rooms are the drinks in the mini-bar is free. Caters more to the Asian market, it is stocked up with more Soya Bean and Lychee canned drinks, rather than soft drinks. Located at Level 3 but looks like the roof top pool, it has a big lap pool. We didn't spot this till our last day. We should have rented these bicycles to cycle on the esplanade to explore the shoreline. Complimentary of the hotel for its guests on a first come first serve basis. Is this a baby pram or a shopping cart? Whatever it is, it's another nice touch for the hotel guests. I've stayed at a number of hotels in Penang. By far, this is one of the best, and I would strongly recommend to any guests going to Penang. Location is good, not too far from the city centre, and yet, have a good sea facing. I would definitely return to stay at this hotel. And not to mention, all the nice touches that differentiate it from other run of the mill 5-star hotel.